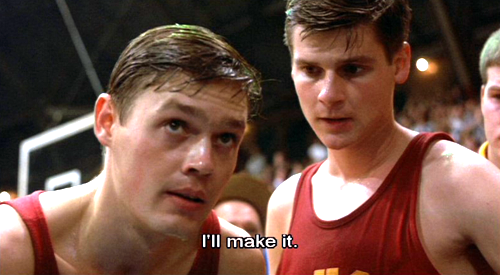 In the movie Hoosiers Gene Hackman plays Norman Dale, the coach of an Indiana high school basketball team. He enforces a “four pass rule” where his players are explicitly required to, you guessed it, pass four times before they take a shot. Coach Dale shows just how serious he is about his rule in the scene embedded below. Why enforce the four pass rule? Basketball is all about high percentage shots. That is, those that the shooter is most likely to make because they are closer to the basket or uncontested by a defender. By passing multiple times it gives the team time to find the right shot rather than just taking the first available one. This logic translates well to engaging with prospects on Twitter. Sure you can jump right in immediately and aggressively start selling. But, that is the equivalent of the low percentage shot. Taking the time to provide value and context to others before expecting them to make an investment in you will greatly increase the likelihood of success in your social selling efforts. Start with lightweight engagements like likes, retweets and follows. This will help your potential customer learn that you exist. It also sets a good tone for the relationship because your are giving them engagement upfront. Make sure that your social profiles are well merchandised. Include a helpful summary in your bio section. It’s also a good idea to include a link to a landing page that covers more about your or your product/service depending on the type of outcomes you are trying to drive. Ideally, this would be a mobile optimized page given the massive amount of social networking activity that happens on mobile devices. Monitor for opportunities to engage directly with the potential customer over time. If it is an important prospect you may want to consider setting up Tweet notifications for their account. You can setup these notifications by visiting their Twitter page and clicking on the bell icon towards the top of their profile. Remember, thinking of social selling on Twitter as an opportunity for a quick score may lead to you getting benched.